The problem with missing the first ten minutes is that that is when ALL the setup happens. Like, there is nothing else to provide a clue as to what’s going on after that. One might figure that to be no big deal. After all, this is an historical film, so it’s not like we don’t know what happens. Though that is true, and though I did know basically what was happening, I was totally lost as to what was happening in the story that Christopher Nolan was weaving. And I do mean weaving. Nolan has a penchant for telling stories non-linearly, and that method of story-telling is on display here again. He builds the plot by moving between non-simultaneous plot lines, building to the final stretch where everything comes together. That’s really cool, but it’s not as awesome when you have almost no context for what’s really happening. Regardless, the first viewing wasn’t a total waste; thankfully, it was a rare 70mm presentation, so the visuals were absolutely stunning.The water shimmered, clothing was rich, and sky was more vibrant. Basically, the colors (though fairly monochrome), positively captivated me. This wasn’t as much the case in digital. Actually, the 70mm look became even more impressive after I watched it the second time on the plain old digital format. Everything was just a little more washed out; it was quite a change from the sparkling, vibrant look. So, what about the movie itself? It is pretty good. I do not think of it as a classic war movie, but it is well-made and worth watching if for nothing more than the history. 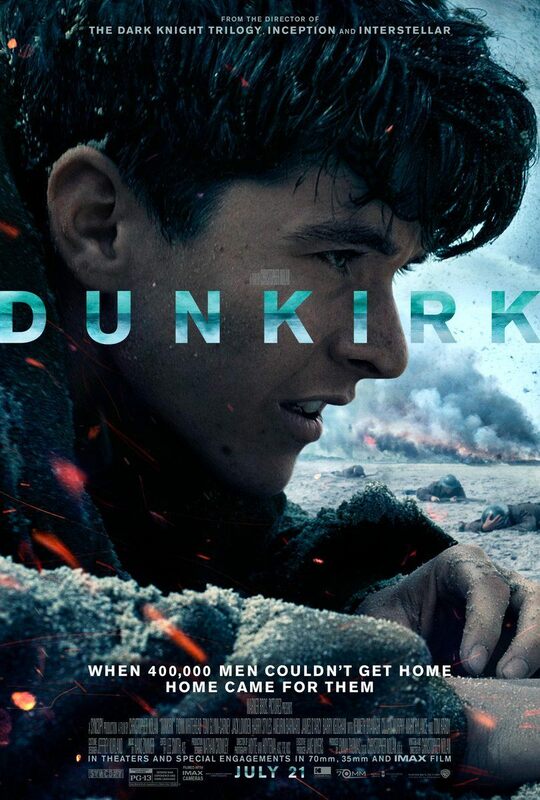 Forsooth, the story of Britain’s evacuation at Dunkirk is a very important element of World War II, and had the events not played out like they did, we might all be goose-stepping right now. So I encourage everyone to watch it if only to be acquainted with how precariously our current situation once hung in the balance. I would be remiss if I didn’t say that the acting is especially good. Note: I’m amazed by Nolan’s ability to get such top-drawer talent so consistently. Kenneth Branagh, Mark Rylance, Tom Hardy, and Cillian Murphy are all on-screen, and Michael Caine is heard in a voice-only part. Talk about a murderer’s row. Strangely, none of those guys are the star. Rather, newcomer Fionn Whitehead holds that honor. He does a great, steady job of holding things together from beginning to end. He seems to be someone to watch for in the future. As for the music, it’s atmospheric Hans Zimmer. It works for setting the tone, but it is not anything to really listen to for pleasure. Surely more can be said, but I’ll end here and just add this: Dunkirk is rated PG-13, so I believe it to be something that almost any audience can enjoy. However, there are many very stressful moments, so I’d caution against letting young children watch it. PG-“13” indeed. Watch it. 7.6 out of 10.